This year will be Missy Moo’s third Halloween. Last year we attempted to have her dress up at Dora the Explorer, but she decided she didn’t want to wear the wig that goes with the costume. Since she has hair that is far from very dark brown to black, she sort of passed off as the cartoon character in question, but I felt like we missed the mark a little. I think I was trying too hard since I had made a costume so that I could be The Map. More details on that in another post. This year, we’re going to see if she wants to be Dora again and this time wear the wig. Hats are now cool in her world and she loves to dress up and pretend to be all sorts of things – a robot, pirate, butterfly queen, and more. Otherwise, I think dressing her up as a pirate is a safe bet. 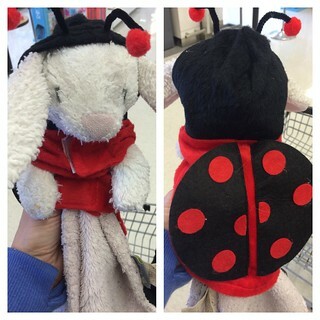 Bunny is all ready to go in a ladybug costume I came across in the pet section at Dollarama. Something that we’ve been doing for the past few years is not giving out a lot of junk food when trick or treaters come to our door. I remember getting ridiculous amounts of junk on Halloween. My parents were pretty cool about it and let me have some that night and the days that followed. But guaranteed just about every year sometime after Christmas, we would find a small bucket or witches cauldron of candy that was abandoned in a corner of my room and was in desperate need of being thrown out. 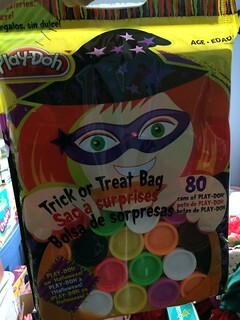 Our local Costco has been carrying large packs of mini Play-Doh that are intended to be given out at Halloween. I saw it a few years ago and immediately bought a bag. I absolutely love this idea! One year, we just handed out a few at a time and for other years we’ve put together little treat bags with Play-Doh and candy of some sort (usually something that’s peanut free). 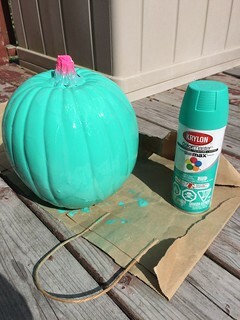 Something else that I’ve heard more about over the recent years is the idea of having a teal painted pumpkin on your doorstep. In most cases, it may be part of the Teal Pumpkin Project., which is an initiative to help let parents and children know that non-food treats are available at a home. With so many allergies affecting kids, I can only imagine how stressful Halloween can be for parents of children and teens with severe allergies. In some cases, just coming in contact with something that has been near an allergen could be enough to put a little one into the hospital or worse. So this year, we’re just going to give out Play-Doh. 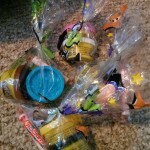 Even if we have bigger kids/teens come by the house, they can enjoy what we’re giving out, or decline the treat. 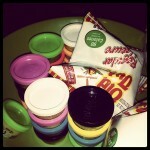 In the past, we’ve gotten squeals of joy and lots of “Play-Doh? Cool!” from more than one trick or treater that is definitely past their tweens. We went to Michael’s this morning and bought a white pumpkin because they were on sale. We also picked up some teal coloured spray paint. Matt has something we can use to seal the colour once it’s been coated to my satisfaction. 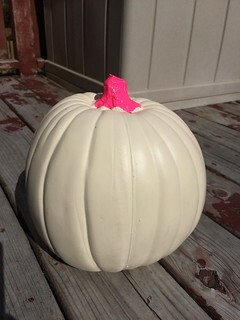 Our white pumpkin with some duct tape to cover the stem so that it remains black. The formerly white pumpkin now looking very different after a couple of coats in spray paint. I’ll post a photo of our teal pumpkin once the final product is ready. It needs a couple more coats and then we’ll seal the paint so that we do not have a horrifying mess if it rains on Halloween.